In this blogpost Farai Chipato addresses the emergence of a new range of social movements in Zimbabwe over the past five years, their achievements in resisting the ruling party and the prospects that these groups could provide long-term radical social and economic change. Over the past five years, Zimbabwe has been seized by a series of interlocking crises, from economic stagnation, to a military coup, and a contested presidential election. In 2013, ZANU-PF, the country’s ruling party won a surprise landslide victory, ushering in President Robert Mugabe to his fifth term in office. The win allowed the ruling party to shake off its erstwhile coalition partners, the Movement for Democratic Change (MDC), and consolidate its grip on power, after five years of a unity government that had seen grudging co-operation from the former rivals. ZANU-PF’s return to uncontested power saw Zimbabwe falling back into the economic stagnation and political repression that had preceded the coalition government, dashing the hopes of opposition supporters and civil society activists committed to social and economic change. The election loss was the latest defeat in a long running struggle by the opposition, creating a sense of fatigue among pro-democracy activists and their international funders. Zimbabwe’s trade unions, heirs to a long and distinguished legacy of labour activism, had been decimated by years of economic hardship, leaving them weak and unable to mount a sustained challenge to the newly invigorated government. It was against the backdrop of this exhaustion of opposition politics that a new group of social movements emerged to challenge the government. These movements broke away from the established NGO-based approach of prominent civil society organisation, by appealing to disaffected urban youth, creating three major upsurges in activism between 2013 and 2018. The first of the new wave of protests was ignited by the work of Itai Dzamara, a young journalist in the capital, Harare, whose lone protest in 2014 quickly expanded into an influential movement. Dzamara was driven by frustration with Zimbabwe’s economic decline and politically repressive government, which had left his generation in a state of perpetual insecurity. His disarmingly simple method, standing in Harare’s Africa Unity Square holding a placard reading ‘Failed Mugabe must go’, soon attracted attention from other disaffected young Zimbabweans, who joined in his regular protests. The movement was dubbed Occupy Africa Unity Square (OAUS), drawing inspiration from the protests that spread across the West after 2011. The tenacity of this new, youthful generation of activists in the repressive environment post-2013 helped to raise the profile of their protests in central Harare, as they weathered harassment, violence and arrests from police and security agents attempting to disrupt their activities. Dzamara’s personal delivery of a petition to the president’s office in October 2014, calling for Mugabe’s resignation, further raised his profile, as did his subsequent detention and interrogation, along with two other activists. As the OAUS began to organise rallies, punctuated by fiery speeches from its charismatic leaders, Dzamara was increasingly viewed as a threat to the ruling ZANU-PF, who were concerned with an Arab spring style uprising by an increasingly militant youth movement. The government became further alarmed when the movement started making connections with more established civil society organisations and the main opposition. In March 2015, Dzamara spoke at a major MDC rally, once again calling for Mugabe to go, and promising further action against ZANU-PF. Days later he was abducted in his local neighbourhood by government agents, with his whereabouts is still unknown as of 2019. Whilst OAUS continued their protests into 2016, led by activist Dirk Frey and Itai Dzamara’s brother Patson, the momentum behind the wider movement stalled without its original leader and the opportunity to unite opposition forces was lost. However, the Dzamara’s disappearance attracted international attention, and generated outrage within Zimbabwe, continuing to inspire activists in his own movement, and more broadly. In April 2016, a second wave of protest activity emerged around a new figure, Pastor Evan Mawarire, a Pentecostal preacher who caused a social media stir by posting a video of himself, wrapped in the Zimbabwean flag, passionately voicing his frustrations with the state of the country. As the video went viral, Mawarire quickly became a leading voice of opposition to the government, as other young Zimbabweans on social media followed his lead in the #ThisFlag movement. The pastor soon faced police harassment and charges of inciting violence but continued to co-ordinate with other activists in calling for protests. In June 2016, 15 OAUS activists were arrested at another of their signature demonstrations, whilst a new movement, #Tajamuka/Sesjikile staged a protest at the Rainbow Towers Hotel in Harare, where the Vice President Phelekezela Mphoko had been living at tax payers’ expense since December 2014. The protest was led by former MDC politician Promise Mkwananzi, now an informal sector activist, and Sten Zvorwadza, of the National Union of Vendors Associations (NAVUZ), a combative advocate for informal workers. The atmosphere of rebellion was compounded in late June, when riots broke out at Beitbridge on the South African border, as the government issued a blanket ban on all imported goods crossing into Zimbabwe. While the government relaxed the regulations somewhat in the face of the protests, activists continued to demonstrate, culminating in the torching of a customs warehouse in July 2016, as protestors fought running battles with riot police. The wave of protests, both in Harare and nationally, came to a head on 6 July, with a mass stay away, which left the streets of the capital empty. The protest was publicised by activists from #ThisFlag, #Tajamuka, and OAUS, with co-ordination and promotion through social media, particularly WhatsApp, Facebook, and Twitter. Whilst a follow up protest was less successful, demonstrations were re-ignited in August, with the introduction of bond notes, a government issued currency that was intended to ease the shortage of US dollars, but which was seen as a return to the discredited Zimbabwean dollar, which had been abandoned due to hyper-inflation in 2008. Several protests went ahead over August, organised by groups like #Tajamuka, with demonstrators clashing with police, who used tear gas, batons and water cannons to quell the crowds. Meanwhile, Mawarire’s legal troubles continued, and on 12 July he handed himself in to the police, to be charged with inciting public violence and disturbing the peace. While the charge was soon dismissed, direct condemnations followed from President Mugabe, and Mawarire decided to leave Zimbabwe for the USA, for his own safety, taking him out action until his return in February 2017. The movements were deprived of another influential leader, and the protests had failed to move the government on the bond notes issue. By early 2017, momentum had once again stalled. The final set of protests was initiated by divisions within the ruling party but drew on the existing social movements and the energies that were unleashed in previous demonstrations. In November 2017, internal divisions in the ZANU-PF government came to a head, leading to the dismissal of Vice President Emmerson Mnangagwa, whose faction had been at odds with an ascendant grouping around Robert Mugabe’s wife, Grace. This precipitated a military coup by senior soldiers, who, alarmed by Grace Mugabe’s rise, sought to remove her husband. However, despite the successful detention and exile of Mugabe-loyalists by the military action, the president refused to resign, leaving the military awkwardly searching for a legal route to remove him without drawing international condemnation. Long-time opponents of Mugabe in Zimbabwe and the international community held back from criticising the coup, preferring a newly coined euphemism, ‘military assisted transition.’ On Saturday 18 November, a range of protest groups came together with ZANU-PF aligned war veterans to organise mass demonstrations in Harare and across the country, calling for Mugabe to go. Zimbabweans turned out for the protests on an unprecedented scale, united across party divisions in the desire for change. Activists from the hashtag movements and OAUS helped to mobilise the youth through social media and led contingents during the event, which took on a joyful, irreverent, atmosphere, as an outpouring of frustrations over economic decline, corruption and mismanagement was vented in the streets. Protestors embraced the armed forces as heroes, as pictures were spread across the globe of triumphant Zimbabweans cheering tanks and congratulating soldiers. When Mugabe stepped down days later, the protests were seen as a defining moment in the political transition, as Emmerson Mnangagwa was sworn in as the new president. The new social movements may have been inspired by a long legacy of activism in Zimbabwe, but they were marked out by some crucial differences from established organisations in civil society. One of the key factors for the movements was their youth focus. Young people represent an increasing proportion of Zimbabwe’s population, with the majority now subsisting through work in the informal sector. Whilst Zimbabwe has a relatively high proportion of university graduates, the lack of available employment has meant that many well-educated young people are either unemployed or under-employed, often left struggling to survive in the informal sector of the country’s major cities. It is these disaffected youth, along with militant student activists, who formed the core constituency of new social movements, rather than the professionals, intellectuals and trade unionists who were the driving force behind previous resistance movements in the late 1990s and early 2000s. A second important factor was the use of social media in disseminating information, connecting activists and mobilising protestors. Young, urban Zimbabweans are increasingly connected to online communities, that allow them to converse freely without gathering for risky political meetings. Facebook is now one of the most popular forums for debate and many Zimbabweans are connected to a series of WhatsApp groups. Whilst Twitter is still a relatively elite space, it has seen significant debate, with key figures in the government, opposition and civil society engaging in conversations and often rancorous disagreement. The ability to share information widely through social media has allowed activists with little or no organisational structure to effectively mobilise significant numbers of demonstrators for actions, and spread their message beyond their immediate locality, capturing a national audience. The increasing prominence of young women as leaders in social movements is another feature that has been noted in the post 2013-era. Whilst the most prominent activists, like Dzamara and Mawarire are men, as the movements grew, female activists played a greater role. Fadzayi Mahere, a young lawyer and activist, became one of the main voices of #ThisFlag due to her campaigning on social media, as well as her interviews with political figures that were broadcast on Facebook Live. Meanwhile, Linda Masarira of the OAUS and #Tajamuka became a powerful presence in street protests and was arrested and held in remand for several months on criminal charges, due to her participation in protest. Both Mahere and Masarira participated in the November 2017 protests, helping to mobilise their social media followers, and later announced their intention to run for parliament in the July 2018 elections. The final important aspect of the new movements is their amorphous and structureless nature. The boundaries between movements are generally porous, as many activists simultaneously worked with several movements at once. As many of the moments were loosely convened over social media. #ThisFlag, for instance, has a huge social media reach, but is still relatively small in terms of staff. Charismatic leaders may create several organisations, moving between them, or leaving them dormant when new opportunities arise. This fluidity makes it difficult to keep track of these movements, and for them to attract funding, either from major donors or smaller philanthropists. Indeed, a key element of the success of these movements has been their refusal to conform to the professionalised structures and behaviours of traditional NGOs, instead presenting themselves as a new, unruly forced for change. Having assisted in the removal of Robert Mugabe in November 2018, the new social movements, and more traditional civil society organisations benefited from the opening up of civic space by the new president. Between his inauguration and the July 2018 presidential and parliamentary elections, Mnangagwa pursued a strategy of international re-engagement, promising democratic reforms, the reduction of corruption, and proclaiming the country ‘open for business’ to entice international investors. In the run up to the elections, social movements sought to mobilise the populace to register as voters, and forged new alliances, exemplified by the Citizens Convention, an activist conference held days before the election to launch a new ‘Citizens Manifesto’, endorsed by a coalition of broadly progressive social movements. However, the cautious optimism of the election campaign gave soon gave way, as Mnangagwa won a narrow victory against his MDC opponent, the popular Nelson Chamisa, amid charges of vote rigging, and questionable pronouncements from the government’s election commission. As protests broke out due to the delay in the announcement of the final results, the government unleashed the army to snuff out resistance, leading to several deaths in the ensuing violence. Thus, despite the success of the new social movements in mobilising resistance prior to the elections, it remains unclear whether they can sustain their vitality and achieve real social change in the long term. It is important to note that the most successful action taken by the social movements, the removal of Robert Mugabe as president, was actually a protest in support of a military coup. The November demonstrations were the result of a faction within the ZANU-PF drawing on popular antipathy to Mugabe to resolve an intra-party dispute. Moreover, the new President, Emmerson Mnangagwa, has presided over a government that has overseen worsening economic conditions, an increasing militarisation of the state and an upsurge in repression of popular protest, following the July 2018 elections. The impact of social movements across the political landscape more broadly is also mixed. Sten Zvorwadza and his vendors movement NAVUZ, once staunch opponents of the ruling party, have been co-opted into the new Mnangagwa government, remaining suspiciously silent during reprisals against informal traders following the July election. Meanwhile, leaders of the hashtag movements who attempted to transform their activist credentials into votes have been conspicuously unsuccessful. 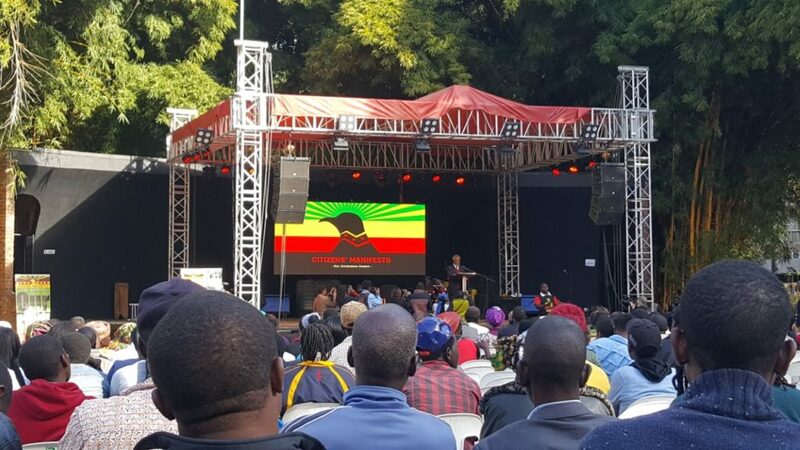 In May 2018, Evan Mawarire launched a campaign for the local council in Harare, as part of an alliance of independent candidates dubbed POVO, which included other prominent activists from the hashtag movements. However, Mawarire’s fame proved incapable of challenging established support for the main political parties, as none of the POVO candidates managed to win their respective seats. Fadzayi Mahere also pursued an independent candidacy, challenging for an MP’s seat in the Mount Pleasant suburb of Harare. Despite a sustained social media campaign, a highly professional manifesto, and high-profile activities in the community, Mahere was also defeated by her relatively unknown MDC challenger. One of the key figures to emerge out of OAUS, Patson Dzamara, used his prominence to campaign for the opposition MDC Alliance presidential candidate Nelson Chamisa, who conducted a powerful and highly personal campaign against the president, based around his magnetic rally speeches. Chamisa proved popular, although he was unable to unseat Mnangagwa, and Dzamara was effectively absorbed into the MDC party, rather than offering a new direction for opposition politics. In the aftermath of the July 2018 elections, the energy around social movements has dissipated somewhat, to be replaced by a renewed energy from the trade union movement. In October 2018, several leaders of the Zimbabwe Trade Union Congress (ZCTU) were arrested in a protest against a new tax on electronic financial transactions, creating a rallying point for resistance to the new government. By December, public sector unions were renewing protests from earlier in the year, demanding improved pay and conditions, as doctors went on strike, and the Amalgamated Rural Teachers Union of Zimbabwe (ARTUZ) staged a high-profile protest march from the city of Mutare, to the capital, Harare, continually dogged by police harassment. What is clear is that as yet there has been little more than cosmetic change from the ZANU-PF government. At the same time, resistance to the ruling party remains fragmented, unable to coalesce into an effective opposition force. However, the renewed vitality of the trade union movement, together with the continuing low-key work of many of the new activists may provide the seeds for a future push that delivers real social and economic transformation in Zimbabwe. Farai Chipato is a PhD candidate in the School of Politics and International Relations at Queen Mary University of London. His research concerns the relationship between development donors and civil society organisations in Zimbabwe, with particular reference to democracy and human rights issues. Featured Photograph: Farai Chipato’s photograph of Kofi Annan addressing the National Citizens Convention in Harare on 19 July 2018. This is a valuable contribution to the analysis of forces for change in Zimbabwe, viewed from the grass roots perspective of some of the social movements that have emerged over the last five years. It is an optimistic piece, written at a time when Zimbabweans must be inclined to despair that little has changed with the transition from Mugabe to Mnangagwa following the recent brutal suppression of popular protest.